19 Marlborough is located on the north side of Marlborough, between Arlington and Berkeley, with 17 Marlborough to the east and 21 Marlborough to the west. 19 Marlborough was designed by architect Abel C. Martin and built ca. 1872 as the home of George Bruce Upton, Jr. and his wife, Geraldine Ipolite (Russell) Rivers Upton. They previously had lived at 16 Brimmer, and in the mid-1860s had lived at 196 Beacon. The land on which 19 Marlborough was built was part of a larger tract of land originally purchased from the Commonwealth of Massachusetts on November 6, 1858, by George Goss. He and his partner, Norman Carmine Munson, were the contractors responsible for filling the Commonwealth’s Back Bay lands. The original tract ran from where 9 Marlborough would be built west to Berkeley Street. On the same day he purchased the land, George Goss subdivided it into smaller parcels and sold them to several different buyers, many of whom then resold the land to others. George Upton, Jr., purchased the land on which 19 Marlborough was built on October 30, 1871, from George Howe, who owned 17 Marlborough, the home of his son and daughter-in-law, George Dudley Howe and Alice Lloyd (Greenwood) Howe. As part of the transaction, George Upton, Jr., agreed to waive any right to challenge whether the design of 17 Marlborough was in conformity with the building restrictions contained in the original deeds from the Commonwealth of Massachusetts, and also agreed to accept the existing party wall being constructed “as though” it “were upon the original dividing line of the lots” (resolving any question as to whether the western wall of 17 Marlborough might not have been built exactly in that manner). Click here for an index to the deeds for 19 Marlborough. George Upton, Jr., was associated with his father’s business, which included ship building and ownership, real estate, and railroad investments. The Uptons also maintained a home in Milton. They continued to live at 19 Marlborough in 1876, but had moved to 79 Beacon by 1877 to live with his widowed mother, Ann Coffin (Hussey) Upton. George Upton, Jr., continued to own 19 Marlborough and on March 1, 1878, transferred it into his wife’s name. By 1877, 19 Marlborough was the home of attorney Causten Browne and his wife Katharine Eveleth (Maynadier) Browne. They previously had lived at 233 Beacon. On September 17, 1881, he purchased 19 Marlborough from Geraldine Upton. They continued to live there during the 1885-1886 winter season, but moved thereafter to 196 Beacon. On April 26, 1886, 19 Marlborough was purchased from Causten Browne by Dr. Buckminster Brown, an orthopedic surgeon. He and his wife, Sarah Alvord (Newcomb) Brown, made it their home and his medical office. They previously had lived at 39 Marlborough. They continued to live at 19 Marlborough during the 1890-1891 winter season, but moved thereafter to The Charlesgate at 535 Beacon. He continued to own 19 Marlborough. By the 1891-1892 winter season, 19 Marlborough was the home of home of Adams Sherman Hill and his wife, Caroline Inches (Dehon) Hill. They previously had lived at 117 Beacon. Their son, Arthur Dehon Hill lived with them. He was a lawyer and strong defender of civil liberties, and later would be known for representing Nicola Sacco and Bartolomeo Vanzetti after their appellate counsel, William G. Thompson, retired. Arthur Dehon Hill married in June of 1895 to Henriette Post McLean. After their marriage, they lived with his parents at 19 Marlborough. 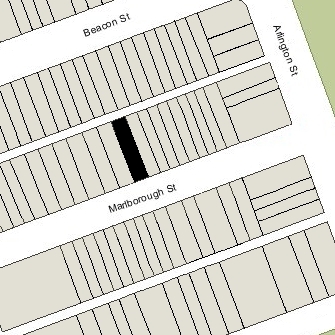 Both the Adams Hills and the Arthur Hills continued to live at 19 Marlborough in 1896. 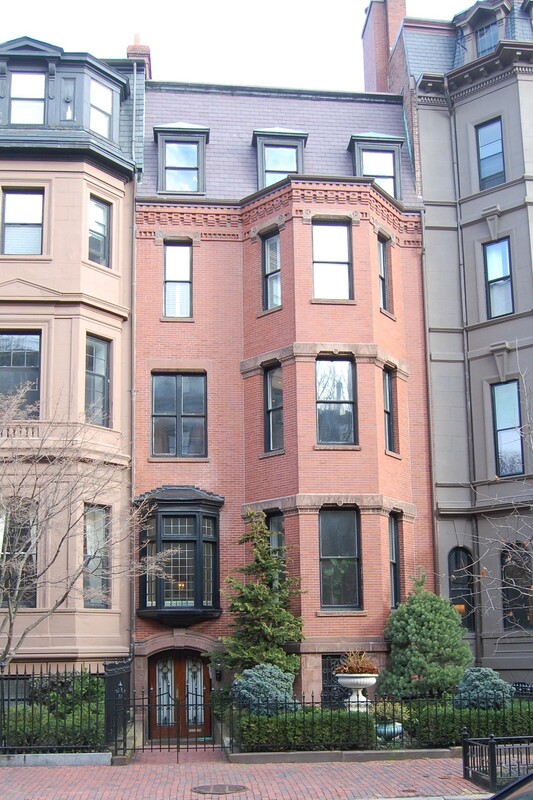 By 1897, Adams and Caroline Hill had moved to 9 Massachusetts Avenue, and Arthur and Henriette Hill had moved to 302 Marlborough. Buckminster Brown died in December of 1891 and Sarah (Newcomb) Brown died in April of 1895. On July 31, 1896, 19 Marlborough was purchased from the estate of Buckminster Brown by Dr. Edwin Welles Dwight. He was a physician and later medical director for the New England Life Insurance Company. He and his wife, Emily Putnam (Williams) Dwight, made 19 Marlborough their home and his medical office. They previously had lived in an apartment at 224 Marlborough. On August 5, 1896, he transferred the property into Emily Dwight’s name. Dr. George Gray Sears, a physician, lived with the Dwights as a lodger and also maintained his medical offices there. He previously had lived (and maintained his office) at 17 Marlborough. Dr. Sears married in 1904 to Ruth Williams (Emily Dwight’s second cousin), and he and his wife moved to a temporary home at 462 Beacon (with his wife’s mother and brother). He probably maintained his medical office at 19 Marlborough until late 1905, when their permanent residence at 426 Beacon had been completed. Other longer-term lodgers with the Dwights included George B. Morison, a cloth and yarn merchant, and Charles H. Kip, a sales agent, both of whom lived at 19 Marlborough from about 1904. In 1905, they were joined by Walter C. Lewis. The Dwights divorced in about 1905 and moved from 19 Marlborough. By 1907, Emily Dwight had remarried to Percy Thomas Clulow. In August of 1910, Edwin Dwight remarried to Laura Howell Napier. On March 26, 1906, 19 Marlborough was acquired from Emily Dwight by attorney James H. Young. By 1906, 19 Marlborough was the home of Mrs. Elizabeth A. (Ames) Carney, the widow of Walter E. Carney, who probably continued to operate it as a lodging house. Her daughter, Loretto Fish Carney lived with her; she was registrar of the Boston Normal School of Gymnastics and later would become an instructor of physical education at Wellesley College (Walter Carney had been captain of the Loretto Fish; she was born at sea in the early 1870s, probably on that vessel). Elizabeth and Loretto Carney previously had lived at 10 Marlborough, where Mrs. Carney had operated a lodging house. They had moved to the Hotel Regent at 780 Beacon by the 1907-1908 winter season; by 1909, Mrs. Carney was manager of The Charlesgate apartments at 535 Beacon, where she also lived. On February 1, 1907, 19 Marlborough was acquired from James H. Young by Henry Bainbridge Chapin. He and his wife, Susan Torrey (Revere) Chapin, made it their home. They also maintained a home in Jamaica Plain. Henry Chapin was an investment banker. He previously had been general traffic manager of the Boston & Albany Railroad (his grandfather, Chester William Chapin, had served as president of the railroad from 1868 to 1878). Henry and Susan Chapin lived at 19 Marlborough until his death in May of 1910. 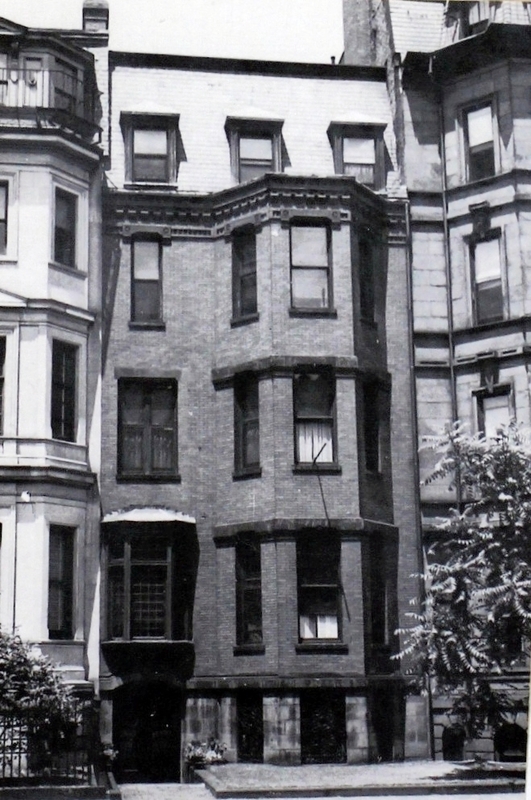 Susan Chapin continued to live there in 1911, but had moved to Jamaica Plain by 1912. She continued to own 19 Marlborough. By the 1911-1912 winter season, 19 Marlborough was the home of Mrs. Rose (Lee) Gray, the widow of attorney Reginald Gray. Their son, Reginald Gray. Jr., lived with her; he was a student at Harvard and later would become an attorney. They previously had lived at 22 Marlborough. They also maintained a home in Chestnut Hill. On February 15, 1925, Rose Gray purchased 19 Marlborough from Susan Chapin. Rose Gray and Reginald Gray, Jr., continued to live at 19 Marlborough until about 1942. On June 19. 1942, 19 Marlborough was acquired from Rose Gray by Mrs Jane (Jennie) (Winchester) Towers, the former wife of Everett Towers. She previously had lived at 29 Marlborough, where she had managed a lodging house. In May of 1943 and again in January of 1944, she filed permit applications to convert 19 Marlborough from a single-family dwelling into a lodging house. On both occasions the permits were denied and then abandoned because of lack of adequate egress. She nevertheless operated 19 Marlborough as a lodging house. Among her lodgers in 1944 was Anthony George Wostrel, an accountant. He previously had lived at 29 Marlborough, when Jane Towers managed the lodging house there. They married in 1944. After their marriage, they continued to live at 19 Marlborough and operate it as a lodging house. Also living at 19 Marlborough from about 1944 were Jane (Towers) Wostrel’s son, Frank W. Towers, and his wife, Mary. He was a lieutenant in the US Army in Europe. After the war, they lived at 19 Marlborough until about 1950. On July 23, 1947, Jane Wostrel transferred 19 Marlborough into both her and her husband’s name. They continued to live at 19 Marlborough until about 1955. The house subsequently changed hands and on July 24, 1958, was acquired by Barnett J. Feldstein and his wife, Edith (Martin) Feldstein. He was treasurer of the General Textile Company; they lived in Dorchester and operated 19 Marlborough as a lodging house. On August 11, 1960, 19 Marlborough was acquired from the Feldsteins by Paul Joseph Valiante and his wife, Alice Eleanor (Tannatt) Valiante, who continued to operate it as a lodging house. They lived in Belmont. On December 31, 1979, Charles Talanian transferred the property to Chatal Associates, a limited partnership in which he and his wife, Nevart (Semonian) Talanian were the general partners. On January 5, 1989, 19 Marlborough was purchased from Chatal Associates by Wilma Brooks and David Randall, trustees of the 19 Marlborough Street Realty Trust. In March of 1989, filed for (and subsequently received) permission to convert it back into a single-family dwelling. The property changed hands. It remained assessed as a single-family dwelling in 2015.